The saga comes to an end. Haidar's hunger strike is finally over after the Moroccan authorities reversed their expulsion orders of the Moroccan Sahrawi acitivist. It appears that Morocco bowed to a request (some see as a demand) from l'Elysee to re-issue a Moroccan passport to Haidar after a personal intervention from President Nicholas Sarkozy, and an implicit endorsement of Morocco's proposal of broader autonomy for the Western Sahara (said to have angred the POLISARIO). The reversal has been hailed by Haidar as a triumph of human rights and international law. 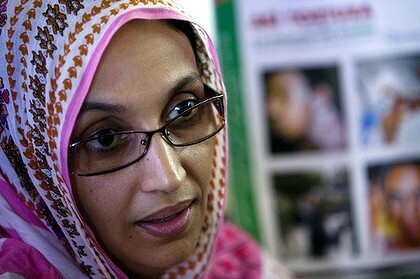 Haidar returned to La'ayoune and was received by her family and friends like a hero, who managed to defeat the apparatus of the Moroccan state. The blogosphere is jubilant about Haidar's return and sees in the break in the Lanzarote gridlock a major PR failure of the Palace, its foreign policy machine, and a monumental victory for Algeria and the POLISARIO. The stalemate definitely re-introduced the issue in its human form to the International scene, even in the U.S, where a certain neocon former foreign policy maker demonstrated in front of Morocco's Embassy in Washington D.C. In addition to Sarkozy's statement welcoming the Moroccan autonomy proposal of the Western Sahara, a possible silver-lining for Morocco in this PR fiasco is the overwhelming consensus that the conflict garners in Kingdom. A cursory look at newspapers and Moroccan blogs reveals an incendiary support for the Moroccan position. Haidar's staged hunger strike and international pressure managed to galvanize Moroccans against what was seen as an Algerian-Spanish conspiracy to embarrass and to depict Morocco as a human rights' violator. The quagmire was equally embarrassing to Spain, in which territory the whole drama unfolded, but undoubtedly strained already tense Moroccan-Spanish relations. Spain appears to have offered no concessions to Morocco in regard to the Aminatou Haidar case at this point. So what's next for Haidar now that she has become an international sensation, already dubbed as the "African Gandhi," a symbol of defiance for human rights? One can easily see her the focus of International human rights organizations seeking to cast more light on the never-ending conflict of the Sands. For Morocco's part, it will be interesting to see what kind of perspective they would cast on the whole debacle and their perceived public and international capitulation. An update on John Bolton. nonetheless, it is still an appearance, and that is serious given his credentials and who and what he represents. Thanks for the comment!